Advocates in the U.S. and around the world this week marked the annual Intersex Awareness Day. Intersex Awareness Day — which falls on Oct. 26 — provided the backdrop for the federal lawsuit against the State Department that Lambda Legal filed on behalf of an intersex person who was denied a passport because they do not identify as male or female. Houston City Hall on Oct. 25 was illuminated in lime green to commemorate Intersex Awareness Day. The U.S. Agency for International Development on Oct. 19 hosted what a State Department spokesperson described to the Washington Blade as “the first-ever U.S. government interagency intersex forum” that the Council for Global Equality and Advocates for Informed Choice, a group that advocates on behalf of intersex children, organized. The State Department earlier in the week declined to comment on Lambda Legal’s lawsuit against it. Jenny Leong, a member of lower house of the New South Wales Parliament in Australia, on Oct. 26 introduced a resolution that calls upon the legislative body to recognize Intersex Awareness Day. Intersex advocates from China, Hong Kong, Indonesia, Nepal, Thailand and the Philippines gathered in the Taiwanese capital of Taipei from Oct. 25-26 for a regional workshop. The gathering took place on the eve of the ILGA-Asia Regional Conference that ended on Friday. Swiss intersex advocates on Oct. 26 marked Intersex Awareness Day by gathering outside the Zurich Cantonal Parliament. German activists on Oct. 22 rallied in front of the Nuremberg Palace of Justice. Their action coincided with a hearing in a lawsuit that Michaela “Micha” Raab filed earlier this year against her former surgeon and his clinic for allegedly performing genital surgery and forcing her to undergo female hormone therapy against her will, even though she is genetically male. 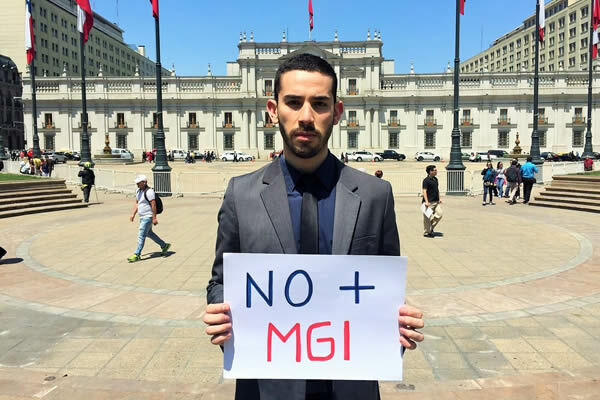 Camilo Godoy Peña, a Chilean LGBT rights advocate, on Oct. 26 presented a letter to the country’s president, Michelle Bachelet, urging her government to do more to protect the rights of intersex people. The U.N. Committee on the Rights of the Child in September published a report that noted, among other things, that intersex babies “have no legal protections” in the country. Andrés Rivera Duarte, a transgender Chilean man who advocates on behalf of intersex issues, and OutRight Action International presented the report. “Medical professionals operate with discretion as to whether or not intersex infants will be subjected to unnecessary and irreversible surgery to visually resemble ‘normal’ male or female bodies,” it reads. Godoy told the Blade during an interview at a coffee shop in Santiago, the Chilean capital, after he presented his letter to the Bachelet government that there is currently no legislation in the South American country that “firmly and clearly” deals with the rights of intersex people. “Intersex people are the least protected people among who are described as sexual diversity,” said Godoy. The Astraea Lesbian Foundation for Justice on Oct. 26 announced that it had awarded $200,000 in grants to 29 intersex advocacy groups in 20 countries. Intersex Awareness Day, which was first held in 2003, commemorates the world’s first-ever intersex protest that took place in Boston on Oct. 26, 1996. The Intersex Society of North America defines intersex as the “general term used for a variety of conditions in which a person is born with a reproductive or sexual anatomy that doesn’t seem to fit the typical definitions of female or male.” Advocates for Informed Choice estimates one in 2,000 babies are born intersex. Opposition to the practice of so-called Intersex Genital Mutilation has increased in recent years. The U.N. Special Rapporteur on Torture in 2013 issued a report that notes intersex children who undergo “involuntary genital normalizing surgery” face “permanent, irreversible infertility” and “severe mental suffering.” The Inter-American Commission on Human Rights, the Council of Europe Commissioner for Human Rights and the African Commission on Human and Peoples’ Rights have also expressed concern over the treatment of people based on their intersex status. A Maryland law that allows intersex people to legally change the gender on their birth certificates without surgery took effect on Oct. 1.